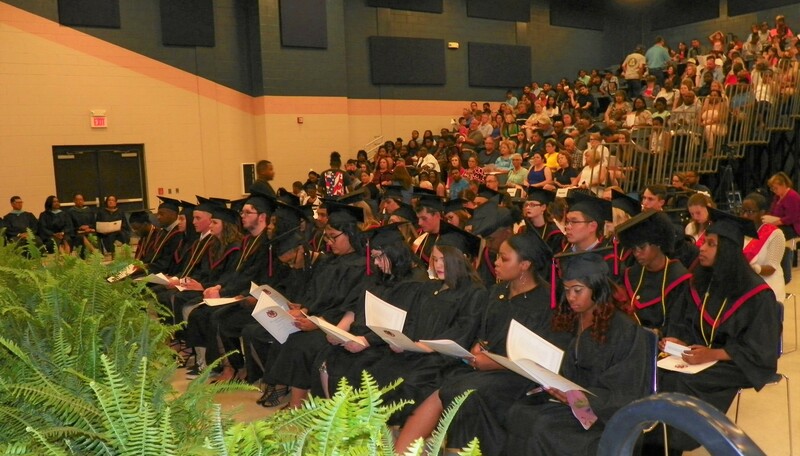 A total of 38 members of the Class of 2018 at the Vance County Early College High School received their high school diplomas and most also received at least one college associate degree during their Commencement Exercises held during the evening of May 24. The commencement was held in the Civic Center at Vance-Granville Community College before an audience of about 900 parents, family members, friends and school staff members. Principal Debbie Hite offered opening remarks and presided over the ceremony. Seven of the graduates received both an associate degree in the arts and an associate degree in science from Vance-Granville Community College. An additional 23 of the graduates received just an assciate degree in the arts. So, 30 of the 38 graduates received a college associate degree. The college associate degrees indicate that they have received credit for completing two years of college level course work. They may now use those credits to enter a four-year college or university as a junior. The diplomas and degrees were presented to each graduate by Dr. Anthony Jackson, superintendent of Vance County Schools, and Dr. Stelfanie Williams, president of Vance-Granville Community College. The graduates are Hunter Antel, Danielle Ayscue, Nancy Bonilla, Andrew Brame, Anaya Brown, Mercedes Brust, Cameron Bullock, Brittany Burroughs, Ke’Moni Champion, Brooklyn Davis, Zairea Davis, Zenee Davis, Hong Dong, Malcolm Elam Jr., Nealee Fisher, Lehman Ford, Alayna Gallagher, Elizabeth Gonzalez, Courtney Herndon, Brandon Hughes, Rosalinda Ibarra, Victoria Inscoe, Lillian Kanouff, Jade Lewis, Seth Moody, Brandy Patterson, Brittney Patterson, Jimmy Ponce, Hannah Roberson, Jordan Rooker, Alexis San Juan, Ty’Ayala Shearin, Evan Stinson, McKenzie Taylor, Latia Thomas, Matthew White, Kaela Williams and Suzanne Williams. Valedictorian for the class was Seth Moody. The salutatorian was Victoria Inscoe. Seth Moody delivers his valedictorian address at the commencement exercises for the Class of 2018 at Early College High School. Those graduates honored as finishing in the top 10 percent academically of the class were Seth Moody, Victoria Inscoe, Lillian Kanouff, Nancy Bonilla, Lehman Ford and Ke’Moni Champion. Early College students serving as graduation marshals were Matthew Denton, Jessica Grissom, Kaitlyn Harris, Samantha Hines, Joseph Penny, Ethan Roberson, Jessica Steed, Alexia Watson and Kianna Wills. Image Information: Early College High School seniors are poised to receive their diplomas.